Saturday, February 21, 2015, 7:30 p.m.
Sunday, February 22, 2015, 2:30 p.m. The Musical Comedy Murders of 1940 by John Bishop is a madcap ensemble comedy that opened on Broadway in 1987. When the producers of a new Broadway show assemble at a wealthy donor’s mansion in upstate New York to work on their show, a blizzard strands them inside and they discover the house is full of secret passageways, sliding bookcases, and an infamous “Stage Door Slasher” from their past. As the snow begins to pile up, so do the bodies, and comic mayhem ensues as the 10 colorful characters try to solve the mystery and find the killer before their final curtain. Poking fun at both the musical theatre world and the murder-mystery genre at the same time, it’s a night of theatre you won’t want to miss! 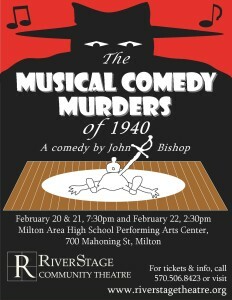 RiverStage will present The Musical Comedy Murders of 1940 the weekend of February 20-22, 2015.